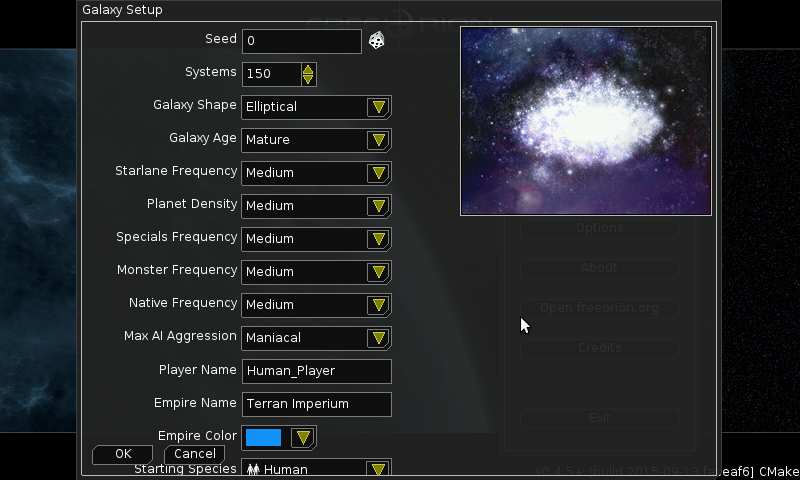 FreeOrion is a free, open source, turn-based space empire and galactic conquest (4X) computer game being designed and built by the FreeOrion project. 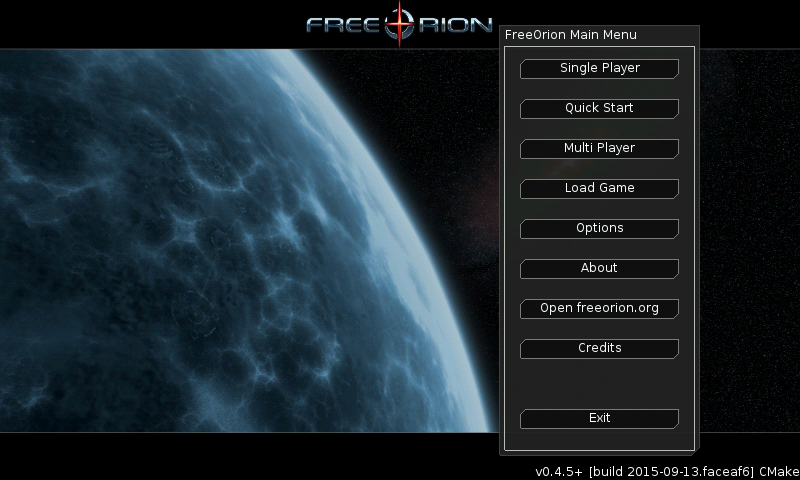 FreeOrion is inspired by the tradition of the Master of Orion games, but is not a clone or remake of that series or any other game. 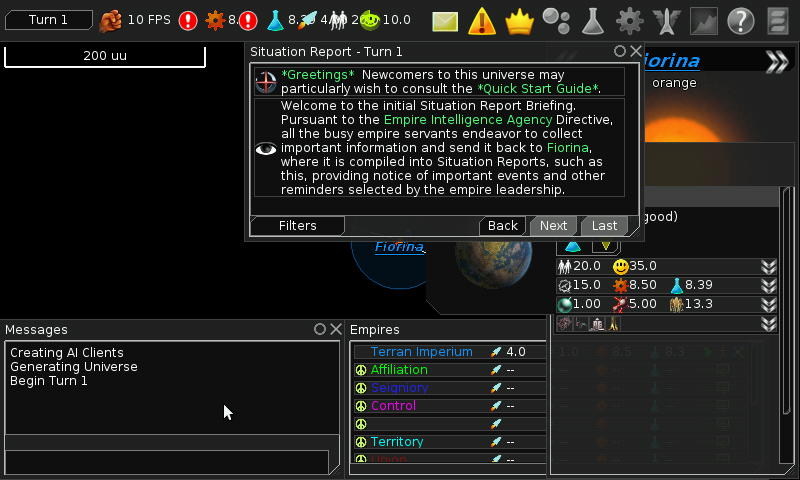 Here is FreeOrion, an open source tactical space trading and conquest game. The game use glshim and the speed is ok (for turn by turn game), and also use Python so the wxPython.pnd must be present too. The relatively low res screen of the Pandora make it quite difficult to play. By default, the game will be on 800x480, so some field may be out of screen. If you use "fake-screen-res" (on by default for Gigahertz and Rebirth), you can also choose 800x600 or 1024x600 virtual resolution. All dialog will fit the screen then, but some text will be more difficult to read. At least but not least, this game use quite some memory, so a Swapfile is mandatory for CC user, and probably a good idea for Rebirth/Gigahertz. Thanks! Performance is fine, but there are random crashes (without any hint in the logs) and it suffers from the 'Monsters do no damage' problem (discussed on the freeorion boards; probably not yet fixed in git). @nobgu: too late, crosscompiling it is fast! If you want to try it: http://ptitseb.openpandora.org/freeorion.pnd and see if speed is still fine. No hurry, it is working really nice right now. Especially since my impression is that the 0.4.5 based version is significantly faster. I'm also working on some interface hacks to make it better fit the small screen. @nobgu: ok, I'll try to update the package to latest sources. Working good, but I'm missing the keyboard panning feature from build 1 (added post 0.4.5).